Summary: We can fight what Paul Krugman calls the great forgetting, dearly bought knowledge about economics going down the memory hole. 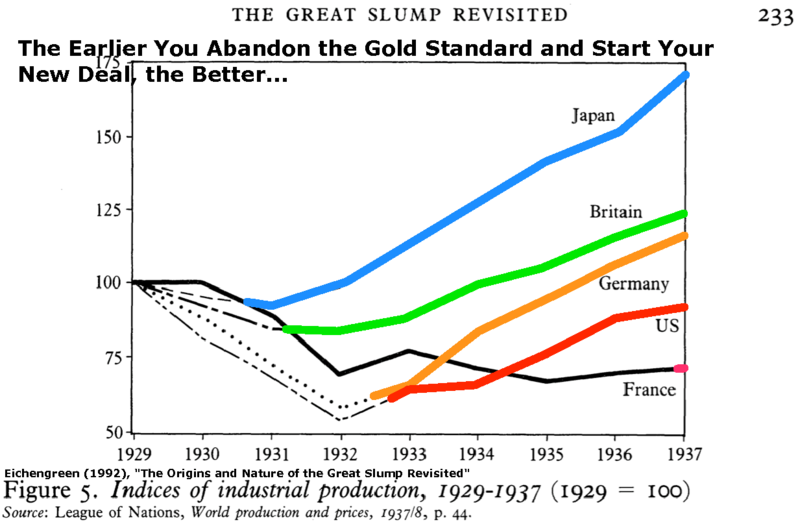 This note from the past reminds us why everybody went off the gold standard during the Great Depression, and that the tendency to plutocracy is endemic in free-market republics. Here is a valuable excerpt from Economic Tribulation (1941), by Vincent C. Vickers (1879-1939). It could have been written today, and its lessons are relevant today. Vickers was a Director of the Bank of England 1910-1919, Deputy Lieutenant of the City of London, Director of the great engineering firm Vickers Ltd and the London Assurance (chartered 1720). In so far as we are able, we must try to assist our fellow-men to understand. This we can do fearlessly; for that which is mistaken or false will carry no weight and will be lost and forgotten, whilst that which is true will prevail. … I who write this, need no proof of the importance of the money system upon the very lives of the people and even to the future existence of the British race, so long as that system fills the position which it now holds in our National Economy. … Ever since that day in 1926, when, not in arrogance but with humility, I felt it my duty to explain to the Governor of the Bank of England, Mr. Montagu Norman, that ‘henceforth I was going to fight him and the Gold Standard and the Bank of England policy until I died’ – (and well I remember the words of his reply) – I have been an ardent money reformer. Almost unbelievably, there are still individuals in this country who advocate a return to gold, emphasising the importance of banknotes being once more convertible into gold on demand. To some people this suggests and implies that all notes should again be convertible into golden sovereigns, pound for pound; but it was never remotely possible to exchange the note issue for an equal number of sovereigns, nor even with the necessary weight of gold bars. The British public, even under the Gold Standard, could only be sure of the possibility of changing notes into gold provided they never asked for it in kind. For there never was, and never will be, sufficient gold to permit the note issue to be thus exchanged. The maître d’hôtel of the big restaurant prints canard sauvage à la presse on the menu, but even if one-quarter of his clientele should happen to demand it on the same day, they would quickly discover that it was ‘off’. In August 1914, when the public very foolishly thought that gold money was preferable to paper money and actually did demand gold for notes in considerable numbers, the Joint Stock Banks, like Brer Rabbit, lay low, and referred clients demanding gold to the Bank of England. A run on the Bank of England followed; and when a paltry ten millions or so of golden sovereigns had been handed over the counter to the waiting crowds, in exchange for notes, the whole money system collapsed and there followed a double Bank Holiday and a moratorium; we went off the Gold Standard, and we were not even permitted to draw our own money from our own bank unless we could ‘satisfy’ the bank officials. Therefore the British public should be warned to regard with suspicion those who glibly talk of the advantages of gold convertibility; for it is a technical term which is grossly deceptive and misleading, and should carry about the same weight as the expression ‘sound finance’. Every new invention, almost every phase in our progress, tends to produce a new nomenclature and new expressions. Some years ago we heard a great deal about ‘rationalisation of industry’, which in plain English meant ‘drastic cuts of wages and schemes- of amalgamation’, so that the price level of production should make the restored Gold Standard look respectable by still leaving a margin of profit for the producer. Similarly, Inflation and Deflation of the currency: We have been taught that Deflation which benefits the lenders of money (such as banks), is at times an unavoidable and necessary action in-order to preserve ‘sound finance’; whilst Inflation, benefiting the debtor (such as farmers, shopkeepers, and traders), entails action which is so disgraceful that it should never be mentioned in any respectable bank parlour. When things changed, so that it had to be mentioned, the word ‘Reflation’ was coined – in order that orthodox economists should not have their delicate digestions upset by being made to eat their own words. And ‘sound finance’ means nothing at all. It is merely a sort of bankers’ slogan adopted to disguise the injustices of a credit system; so that whatever the form of financial jugglery in question might be, it should, in the ears of the public, give the true ring of the genuine coin or, at any rate, have a comforting sound about it. Whether we like it or not, we must realise that the opinion of the City of London very often does not represent the opinion of the Country; that ‘sound finance’ is essentially an expression invented by the, banker and the dealers in credit. It involves stout adherence to a customary ratio as between deposits and loans; it entails the principle of giving the lowest possible interest to the depositor and obtaining the highest possible return from the borrower; it favours, quite naturally, the rich, as against the poor, borrower, and gives a preferred credit to saleable collateral in the form of Stock Exchange securities rather than, to any other security. But, above all, it entails that there should exist at all times a demand for credit and currency which, normally, exceeds the supply; and it prescribes that there should be no reform and no legislation which might deprive the money industry of the natural and interested advantage of its monopoly or of its existing policy. It permits and often encourages the taking of risks on the part of Industry and Commerce, but must avoid participation in that risk. It favours Deflation; but abhors Inflation even when it is rechristened Reflation; and, in an emergency, is always the first into the lifeboat, the first to leave the sinking ship, and the last to man the pumps. It refuses to understand that money should be only a means of facilitating an equitable barter economy, and that there can be in reality no such thing as ‘sound finance’ so long as the country is unsound. It fails to believe or to understand that the welfare of the country’s productive industries are of far greater national importance than the non-productive business of withholding, managing, and distributing a credit founded upon bank deposits which are the property of the bank’s customers and are based upon the unlikelihood that depositors will all withdraw their credits at the same time. Under the immense advantages of the cheque system, hundreds of millions of pounds change hands every week between the bank’s individual customers. This cheque system is dependent upon the integrity of the people as a whole, and mainly constitutes a series of book-entries involving the movement of an extremely small percentage of actual currency. Lest they should spread and replace democracy, this country now concentrates upon attacking or distrusting dictatorships in any shape or form in other countries. A constructive monetary policy in our own country would strengthen the power of democracy, and would cast out those enemies in our midst who are trading upon our supposed ignorance whilst depriving us of adequate means to express our opinions. In short, it has begun to be generally realised that the free vote of the people no longer insures democratic government except in name, and that the widespread influence of money, of finance, and of ‘big business’, and, above all, of international finance with its impartial patriotism, not only dominates governmental policy, both national and international, and affects the lives and livelihood of the people, but has very nearly succeeded in converting our boasted democracy into what is virtually a financial dictatorship. Do the people of this country want such a procedure to continue? We are prepared to admit that, without honest and skilled leadership, democratic rule is akin to mob law; but are we prepared to entrust the future of democracy to sectional influences governed and controlled by those few who still govern and control our capital, our money, and capital’s international finance? Strenuous efforts have been made over some twenty-five years to patch up the money system in an attempt to make it last a little longer; but it has stood, and now stands, in the way of progress and social betterment, thereby creating universal unrest and a tendency to obtain by force what cannot be obtained otherwise. For the sake of our children let us take warning in time. Let us discard the policy of inaction and pretence, and boldly face the fact that it is not the inevitable smoke of the galley-stove which assails our nostrils but that a fire is raging in the hold and that the ship of State is in imminent danger. Our democratic system and our existing financial system can no longer live together; one of them must give way to the other.